Connected to the back of the engine, the transmission sends power to the wheels. The transmission is responsible to also maintain the engine’s Revolutions Per Minute (RPM) as determined to be the most efficient for the speed called for by the driver. The RPM’s of the engine are inversely proportionate to the speed of the wheels. At low speeds, the engine rotates much faster than the wheels. Conversely, at higher speeds, the engine’s rotation is slower than the wheels. In addition to the “Drive”, or forward gears, the transmission also has a “Reverse” position that allows the vehicle to go backward. The “Neutral” position disconnects the transmission from the engine and “Park” for , well, parking. There are other, less common layouts. Variations are determined by weight distribution requirements or space restrictions. Some vehicles (eg, Porsche) place all components, including the engine in the rear of the vehicle. 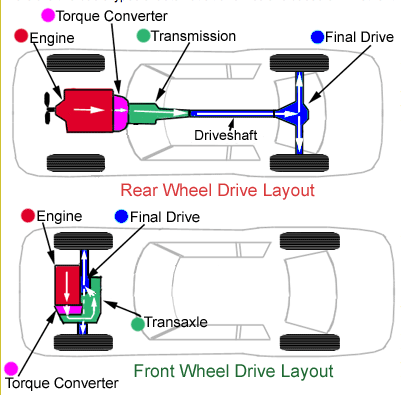 Some front wheel drive vehicles do position the engine front to back, but sideways is the more common arrangement. Additionally, the arrangement for 4-wheel drive or all-wheel drive vehicles will vary in arrangement and power flow. Each component will be covered in more detail in future posts. Suffice it to say that regular inspection and maintenance of transmission fluid is essential to as required by the manufacturer. If the Automatic Transmission Fluid (ATF) is cloudy or has a burned odor, this could indicate a need for full ATF replacement or transmission service. Any changes in shift behavior can indicate a problem with your vehicle’s transmission and should be inspected immediately by Edmonds Transmission Service & Repair technicians. Should you note any leakage (ATF will appear reddish), again, immediate attention is required.